The baseball cap is another nod to the developing sporty trend. In some instances it’s a fancy cap, made of leather or wool with studs and hardware. 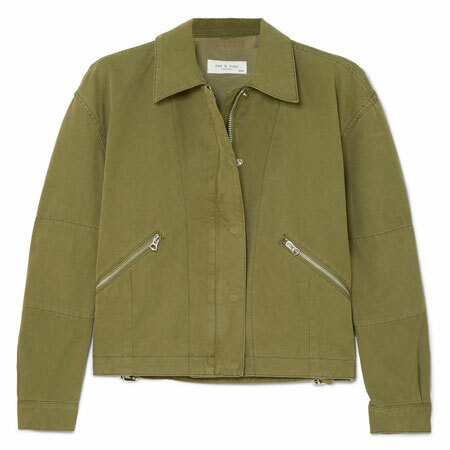 Or it’s nothing but mega casual canvas, cotton twill or denim. Baseball caps are no longer a fashion faux pas when worn in an intentionally fashion forward manner. 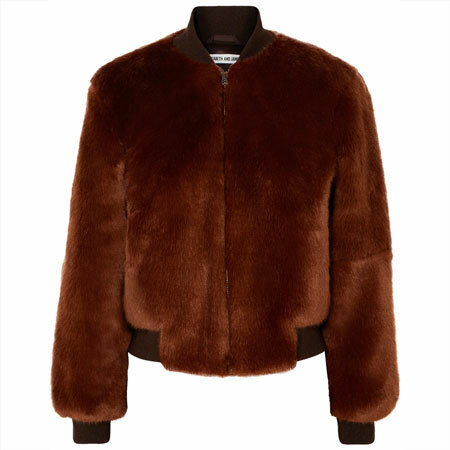 That means with trendy, dressy pieces, luxurious fabrications or tailored items. 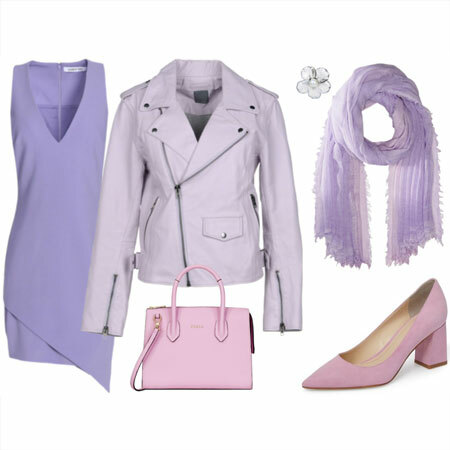 At least one item in the outfit needs to be dressy, even if it’s just the shoes. It’s also got to be the right baseball cap, which means no sports slogans or the like. A fairly haute baseball cap, for lack of a better description. 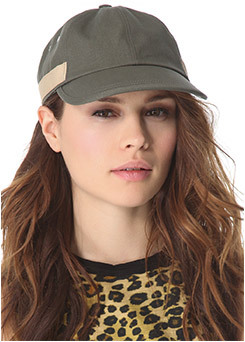 The photos below from retailers are not the best representation of how baseball caps are being worn in fashionable ways. So I’ve put together a pinboard of head to toe street style looks that show baseball caps in stylish action. Do look at the outfits on the pinboard before you formulate an opinion on the trend. I like the trend because it’s playful and fun. It’s yet another example of an irregular juxtaposition of different items in one outfit, which is all the rage at the moment. The baseball cap successfully dresses down a look and adds a casual element. Unexpected, witty, and eye-catching. 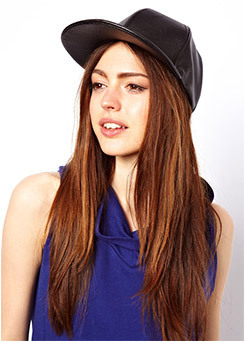 To my eye, you need at least shoulder length hair sticking out from under the cap to feminize the trendy baseball cap. Long hair also adds an extra textural dimension to the overall look. I don’t see it working as well on someone with short hair, which is often the case with hats. 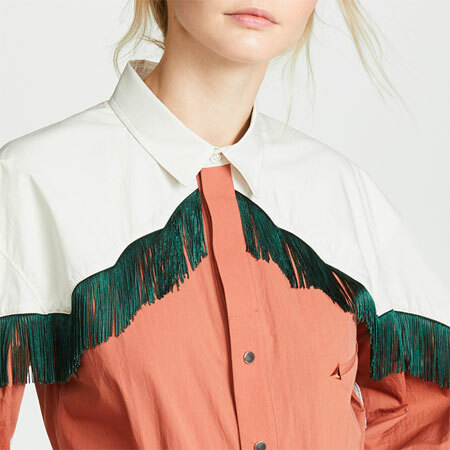 Although I have embraced elements of the sporty trend with passion — like wedged Converse, a bomber jacket and sporty clutch handbags — I won’t be wearing this one. I don’t have the hairstyle to pull off the look and the item doesn’t gel with my style persona. That said, I do like the outfits on my pinboard because these ladies have created attractive and interesting outfits that are just cute with a capital C.
What’s your verdict on trendy baseball caps? I’ll be skipping this trend. First, I look awful in baseball caps, and second, I think this trend looks better on those that are younger. The only time I wear one is for shade when gardening or walking the dog! I second Karie. This trend is simply not for me. I have notices this new board of yours on Pinterest yesterday and wondered why…now I have my answer! I may accept this look when cap is fancy: it just looks like a variety of a newsboy cap or something to me. However I will not be sporting this trend for the same reasons as you – short hair and does not mesh with my style. I have even less ‘sporty bones’ than you as I am still to warm up to a single sporty trend. Love your pinboard Angie! Definitely not a trend for me. It’s does look cute on some of these women. I have short hair – which looks good in a newsboy hat but not baseball ones. Also, somehow this feels like a younger (than me) trend to my eye. I’ll stick with my newsboys — not liking this trend so much. This is a look I’ll leave for the young long-haired lasses and enjoy on others. Strangely, I see caps most on 40-somethings shopping at Nordstrom with teen daughters. Hair is usually in a ponytail pulled through the back of the cap. I have the long hair, but there is not a lot of sporty to my look. I also noticed most of pin board lasses were wearing very high heels, which does seem to really help pull the look together. I also fear this may be something for a younger woman. Not for me either thanks, Angie; even though I have the right length hair. Although I love a good hat, I have never worn a baseball cap and will probably keep it that way. I don’t have enough hair, and baseball hats have pretty much the same association as denim skirts do for me. I don’t own one but would love to play with a simple black leather one. Isn’t it amazing how or eye evolves in just a few short seasons? 1. My hair is too short. 2. Baseball caps look hideous on me. 3. My daughter would think I am trying to copy her. But I love the pinboard looks and will enjoy it on others! On my way to the zoo! I think I need that the last one, naturally! Nope. Won’t be sporting this trend at all. My hair is too short and I hate how I look in caps. They make me look like I’m bald underneath. Then when you add in the glasses, it’s just too much going on around the face area. Cute if you’re younger and have long hair though. And of course an added bonus of helping you out in the sun. It’s definitely not for me (I do not like myself in any hats) and I’m now certain I must have a poison eye for it as I want to take them off everyone on your pinboard. I do not care for baseball hats on women for any reason other than playing baseball (or softball). I think I have a poison eye for this look. Baseball caps are great for wearing to actual baseball games and being outdoors. 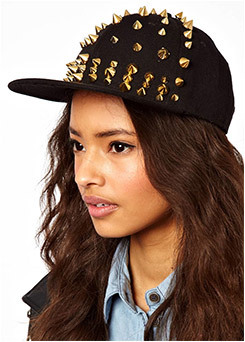 Wearing a ‘fancy’ baseball cap as a fashion statement looks silly to me. I wear them for fishing. It’s the only hat the dh doesn’t give me the side eye for wearing. I have yet to find a hat that I actually look good in. I love a good hat, but I think I’ll pass on this look. I have short hair, though I’m not quite ready to forgo hats just because of it. I just don’t see this as fitting into my style. The outfits on your board have a very refined feel to me. I strive for refined but find that I can never quite get it right. So I think I’d just end up looking a mess. Lovely outfits on your board, Angie. Hmmmmm…..I think I’ll have to pass on this trend. My hair is too short for baseball caps and they look really bad on me. Most hats do. The only time I wear one is when I’m at the beach and want to protect my face from the sun. I think this looks fine on the younger ladies with long hair but not on me. I do wear my favorite Cubs cap when I walk for exercise, and a white baseball-style cap for tennis, but other than for sporting activities I will leave this look for the teenagers. The leopard one is cute and fun, though! I don’t think these caps look any more ridiculous than the newsboys and trilbys that has been in style for a the last few years. I like that they’re in neutral colors and don’t have logos or sayings on them. The young women on your pinboard look fab in them! I’m not much of a casual hat person, but my hair is just long enough now that I can wear a ball cap on my walks to keep the sun off my face without looking like a chemo patient. I would like to note that these technically are NOT baseball caps because they lack team logo’s. These are jockey style hats which the baseball league stole from the Equestrian sports at the turn of the century. I hate baseball caps because on most women they are unflattering. I love these ‘jockey hats’ because they are using more interesting fabrications and the brim length is shorter than a ‘baseball’ cap. I like it! I am really into casual hats to shade my face (in addn to sunblock) and cover my helmet hair. If I find the right one, with a smallish crown that doesnt overwhelm you might see me sporting this look this summer! And since i am tired of the upkeep of a short cut I think this might be just the excuse to grow out the locks a bit…. This looks so cute on some people but I am not much of a hat person these days. I do have one or two cute hats and also a couple that sport my fav teams lol but I don’t wear them very much. I’ve checked out the pinboard, and still, nope. Sorry! I’m going to have to give this one a pass, long hair or no. I won’t be sporting this look. It’s way too casual and sporty for me, plus I don’t wear fitted caps. I’m definitely passing on this trend. There are several reasons but mainly hats aren’t comfortable nor are they really me. The few I’ve tried end up sitting on a shelf. I might try another ths summer, as we’re going to Vail for a few days. The last time I hiked on the mountain top, I burned my scalp. Ouch!! These are really cute on the pinboard but I’ve never liked baseball caps on myself. I must prefer newsboys or fedoras. I would love to make this work because I like wearing hats, and caps are also very practical to keep sun out of your eyes. However, I find the details of this look sufficiently complicated to get right (time-consuming/effortful), that I will leave it to serendipity that I might spy the right elements somewhere, rather than setting out to make this work for me. 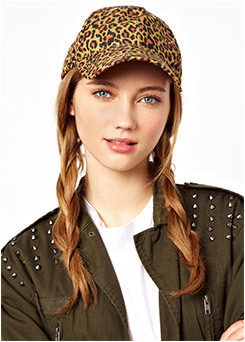 Wish I could wear a ball cap – but alas, this look is not for me. My hats in the summer tend to be more functional – as in protection from the sun. I think Sarah A is right that a lot of the success for this look is about the height of the crown. The caps I like best in the photos are the ones with a fairly short crown (fit close to the natural shape of the head) vs. the higher, more boxy ones. Angie I’ve seen this look on many women and most of them look really pretty in it, but it’s not a trend I can copy because it’s just not me. I’ve been wanting to try a beret hat or one of those smaller hats made of leather (or wool) and canvas but just haven’t been focused enough to go to a retailer to try them on. Winter this year possibly..
well, too young for me! Yes! I hear all those who read the look as “too young”. That said, I do think that the haute cap can be worn by women over a certain age with the right mix of sophisticated pieces – and a spunky personality to boot. I agree with the others … longish hair is needed for a cap. But I disagree that the cap needs to be fancy. I like authentic caps made of fabric and even the logo (like a nostalgic tee). They seem a little forced when “done up” in fancy fabrics. 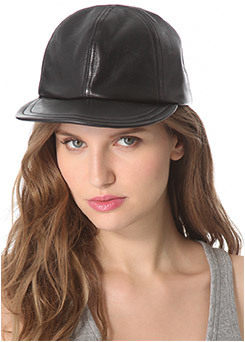 I can imagine a woman my age or older rocking, say, an obviously expensive leather baseball cap. But generally I think it’s a young look and I will definitely be giving it a pass. I think it looks interestingly weird and I love it. Angie, you’re turning me into quite a playful fashionista. I think short-haired lasses can still wear caps, especially if a bit of bangs are peeking out. Think Amelia Earhart in her aviator cap, just another way to look feminine. I always say never sa never but this does not appeal to me. I am drawn to the leather beanie rather, just feel it fits my style better…but much harder to find. I like the canvas versions best. I’ll be on the look out for one during my next shopping trip. The biggest appeal for me, is eye and face coverage on the sunny days. It would be nice to find a hat that’s not covered in sports logos. A trend I’ll be skipping – never looked good in that hat style but I will and have been wear lots more hats. My hair is just barely long enough to pull this off. I do like the function of this trend — keep some sun away from your face. I wear a baseball cap in the Summer for that reason, for example if I go to a baseball game. My biggest challenge here is to keep the look from being too cute so it is age appropriate. 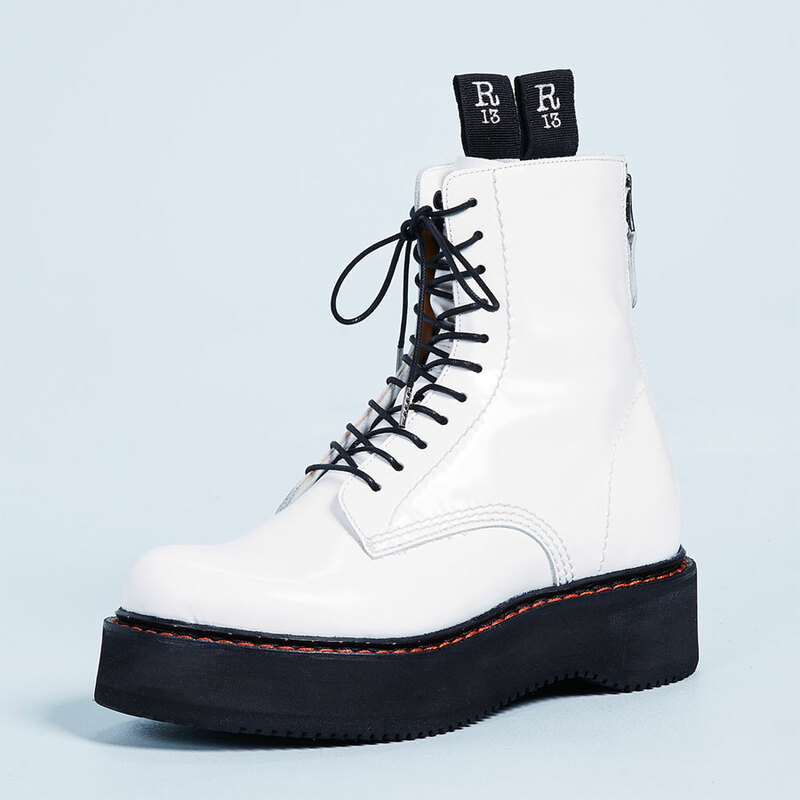 These look cute on the young girls, but I’m another who’ll be skipping this trend…unless I’m actually at a baseball game! I would wear this look in a second if I had the face for it. But I don’t – I need a newsboy cap or something with more volume on top. And yeah, I fear it might be too young for me. DH and DS have a massive collection, though! Hmm, so the look is forever age appropriate on a male but there is a limit on how long a woman can wear the same piece. I will have to ponder this some more but TBH it smacks of double standards. Eh, I’ll pass. I wear baseball caps gardening or sailing and that’s about it. Like others have said, it’s a young look, and while I like sporty style, I prefer it to be on the sophisticated side and baseball caps just don’t fit that look, IMO. Ya. That’s a no. Haha. I will wear a cap, but I just cannot wear a baseball cap on principle. Y’all would understand if ya lived in my ‘hood. It’s wrong enough to see scrawny dudes in plaid shirts and John Deere baseball caps in the middle of the city/drinking soy chai lattes. Angie you put together a stylish fun pinboard but I still don’t think they will make their way in to my style persona, whatever that is. Never liked it for , and will not start liking it just because it is now “in”. Add to that that my grandsons live with their baseball hat glued on their head, even at meal time. I wonder if they sleep with it !! Trends give me a very uncomfortable feeling. In fact, I feel manipulated by an industry that decrees that something is a fashion faux pas one year and the height of style the next. Sorry. Wanted to say “never liked it”, no for. I’ve never liked baseball caps on men or women, so no, I would definitely skip this even if I had longer hair. My 88 yr old mom looks cute in her leather newsboy cap, so I like that look. No, no never. Don’t care how you ‘style’, gussy it up, or do whatever, it remains a baseball cap, and it does not belong on a woman’s head unless you are involved in some sport’s activity. A couple years ago we went to cottage country for a holiday and bought some caps in a gift shop: they had sort of an Ed Hardy inspired applique, some chains, and some studs and sparkly thread. My daughters and I wore them in sort of an ironic way. I think we looked cool. I may consider this again, in a similarly casual setting! I will also pass on this one. Too many years of seeing men trying to cover bald spots using baseball caps (and not removing them inside) has me cringing anytime I see one. Like MRL they have those associations for me too. I think they would look great on the right person. If I’m dressed casually enough for a hat like this to blend in with my outfit, I’m probably doing something that involves paint. Or ticks and head-sweat. I like the look, as long it is really intentional. It would also fit into the sporty side of my style, but because of the short length of my hair I would not be able to pull it off! Sadly, I’ve never been able to wear a ball cap and look good, even in my younger days. I’ll leave the baseball cap wearing to DH. I do appreciate hearing about these trends, though, Angie, even if I have to pass. Thanks for keeping us up-to-date! I’m in a teeny tiny minority! I like hats and do have a couple of caps in this style (that don’t have Orioles logos or camera gear logos on them so I may try this out one day. Especially while my hair is a little longer. I do agree that hats work best when there is some significant length to a person’s hair. I honestly thought this was an old April Fool’s Day post. This is one trend I’ll watch from the sidelines. With my short hair, it would not look as good. However, I’ll enjoy seeing others interpret this look! Oh, no–and next we’ll be wearing them backwards, right? (I should have that listed as one of my style pet peeves. What’s the point of wearing a billed cap backwards??) I do like the one you’ve labeled your favorite baseball cap look so far–very cute look! 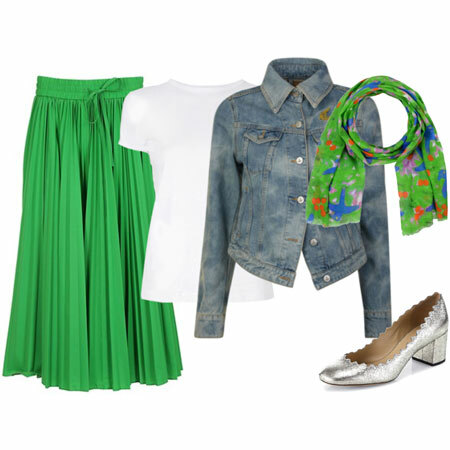 It works well with the boyfriend jeans and big scarf and those killer pumps. But I do not see myself wearing one, except to run, and I always, always wear it to run. It keeps my hair out of my eyes and sweat off my glasses. reminds me of edina from ab fab a comedy show in uk.also what we call a bit chavvy.not for me im afraid! I like it. The pinterest board was inspiring. I am going to find myself the right baseball cap. my hair is WAY too short for this trend! and for practical purposes, a baseball cap doesn’t protect your neck from the sun if you have short hair. I would love to wear my Boston Red Sox cap. Even though it is a sports team (my fav), I think in light of the recent events in Boston, it has a larger meaning. I have shoulder legnth hair so that should be fine. I have a full face and don’t know if the look jives with anything but a small face. I want to keep the look feminine.